Texas Caviar has got to be the best thing since sliced bread. 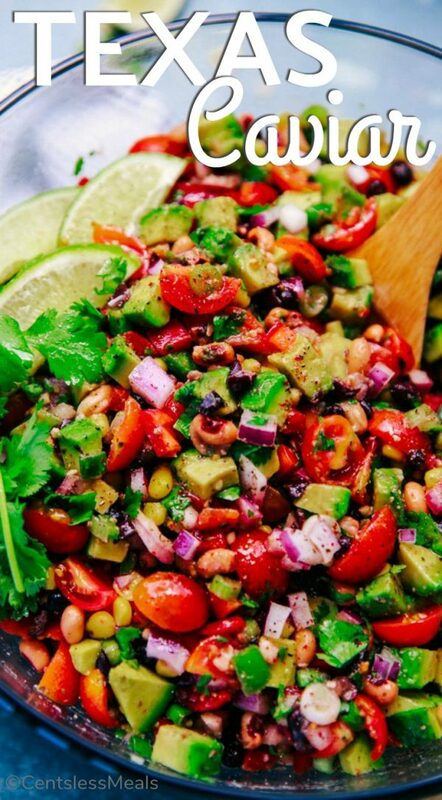 Loaded with beans, corn, jalapeños, cilantro, avocados, and so much more all tossed with a zesty Italian dressing, it is the perfect for any occasion or any time of year! 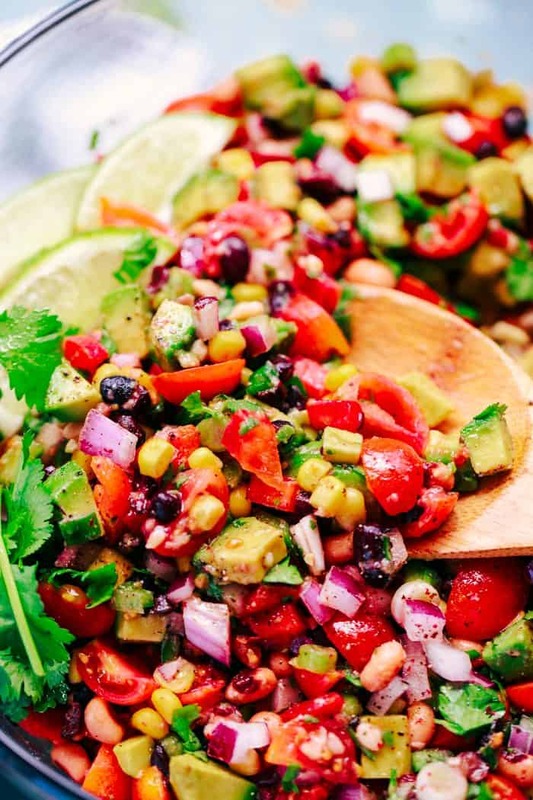 Whether you choose to serve this Texas Caviar as a dip served with nachos or you choose to serve it as a topping for burgers, tacos, salad or any grilled meat, you will not be disappointed! 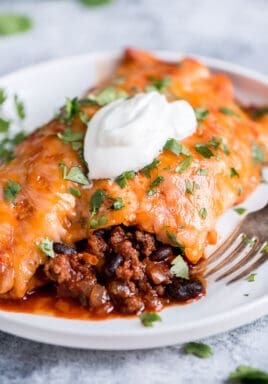 What a great addition to your mealtime menu! If you are looking for a potluck or summer BBQ dish, look no further! 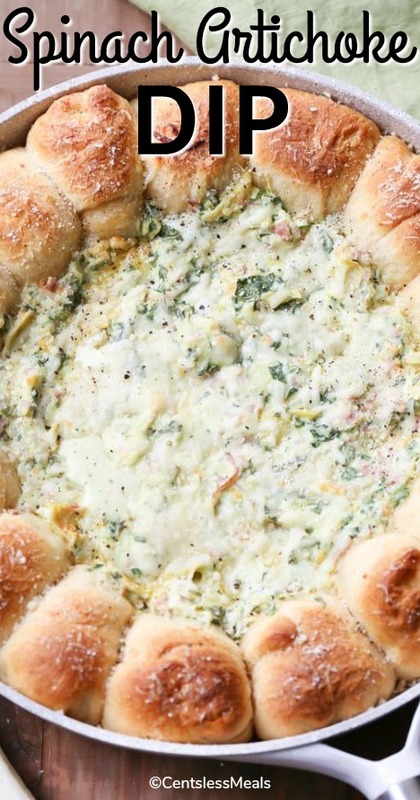 This recipe is full of amazing, fresh and natural ingredients! In addition, all the good fats found in avocado makes it a tasty and healthy substitute to other cheese or cream dips. If you have never had Texas Caviar then you want to stop what you are doing and make this amazing dip. 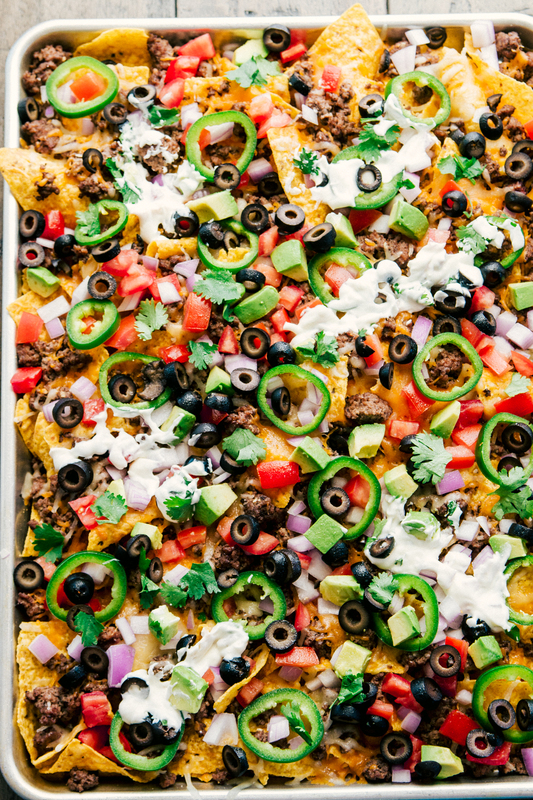 I call it a dip, but it can even be a topping to tacos, fajitas, burritos, nachos, burgers, and so much more. 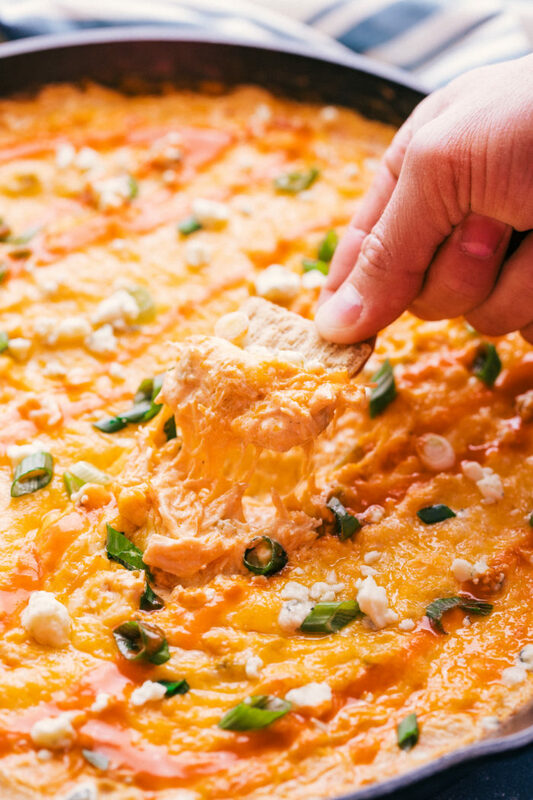 It is the dip that makes it presence known whenever brought to the party because there are so many fresh ingredients and they all add so much flavor and texture to every bite. Not only is Texas Caviar the jack of all trades when it comes to party dip, it is so simple to make and best when made ahead to give all the flavors a chance to blend. Furthermore, this Texas Caviar is mixed together with a zesty italian dressing and topped off with a twist of lime, garlic salt and pepper. As a result, it really is so good you can just eat it by itself. 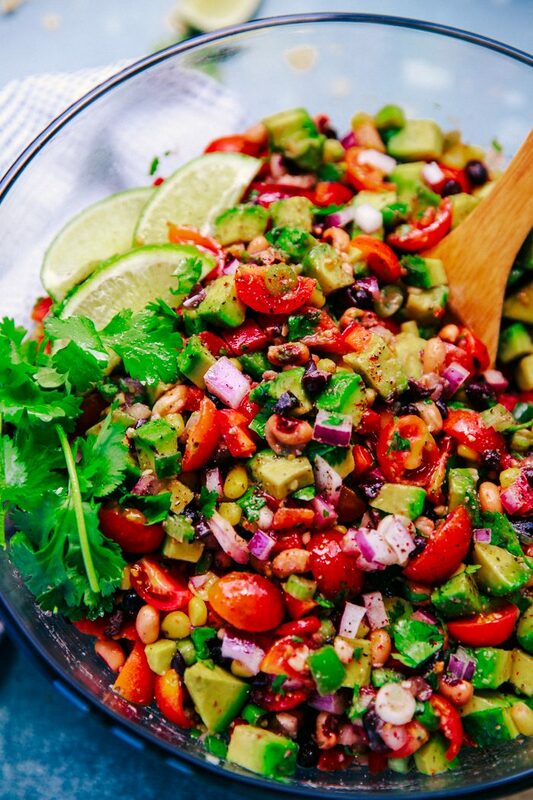 Texas Caviar or also referred to as cowboy caviar, is a salad made up of black eyed peas and served with a vinaigrette style dressing most commonly served as a dip with tortilla chips. It is considered a “salad” but eats like a dip or salsa. How do you make Texas Caviar? This recipe really is easy to do and is perfect for the chef in you at any level. Rinse and drain the black beans, black eyed peas, and corn. Place in a large serving bowl and mix to combine. Prep all the rest of the vegetables. Using cherry tomatoes, quarter them and add them to the serving bowl. Chop jalapeños, green onion, red pepper, cilantro, garlic, and red onions, and avocados. Add to the bowl and gently toss to combine. Season with garlic salt, pepper and a juice from one lime. Just before serving, add zesty italian dressing and mix to incorporate the salad with the dressing. Note: Wait to dice and add the avocado until ready to serve to avoid becoming mushy and brown. Do you have to use Zesty Italian Dressing? No. Alternatively, you can also use a 1/2 cup of olive oil with juice from one lime as well. 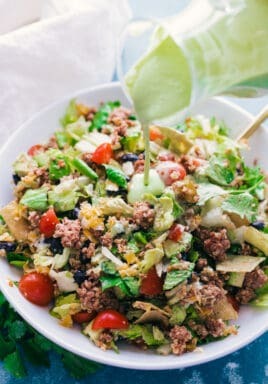 In addition, you can make your own zesty italian dressing or leave the dressing off completely and let the juice from all the ingredients serve as the dressing. However you make it, you can’t go wrong. 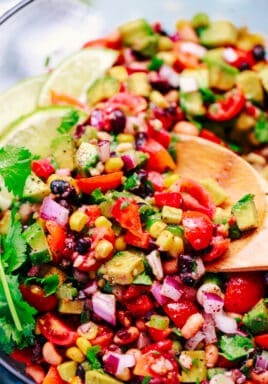 Texas Caviar is loaded with amazing all natural ingredients. 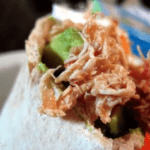 Furthermore, with the addition of avocado, it provides a good source of healthy fats and is also a healthy substitute to other cheese or cream dips. What goes with Texas Caviar? The options runneth over, but here a few of my favorites. So, the next time you want to bring a fabulous dip to the party, make this Texas Caviar – it won’t disappoint! Texas Caviar has got to be the best thing since sliced bread. 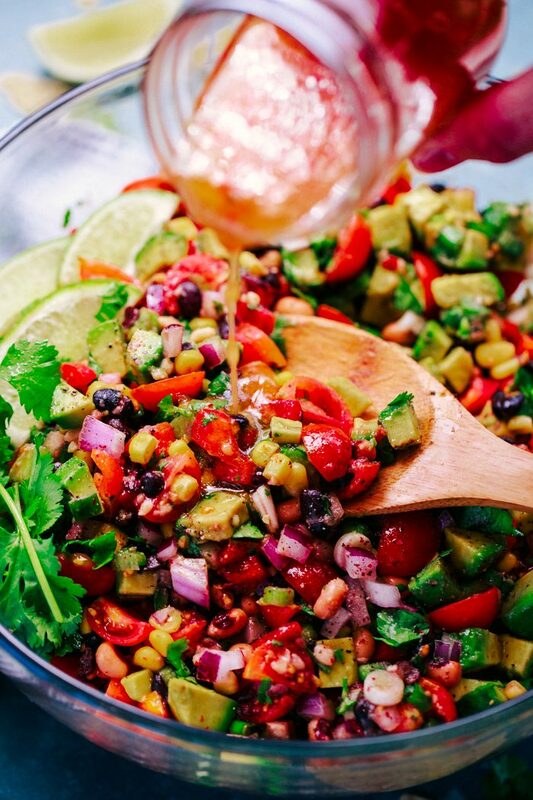 Loaded with beans, corn, jalapeños, cilantro, avocados, and so much more all tossed with a zesty Italian dressing, it's perfect for any time of the year. In a large serving bowl add all ingredients, except the dressing and avocado. Mix gently to combine all ingredients and refrigerate until ready to serve. Just before serving add the avocados and Dressing. Stir to combine and serve.